The researchers employed X-ray scattering techniques at Argonne's Advanced Photon Source (APS), a DOE Office of Science User Facility, to monitor the nature and stability of the catalysts during the catalytic testing of the clusters in real time. 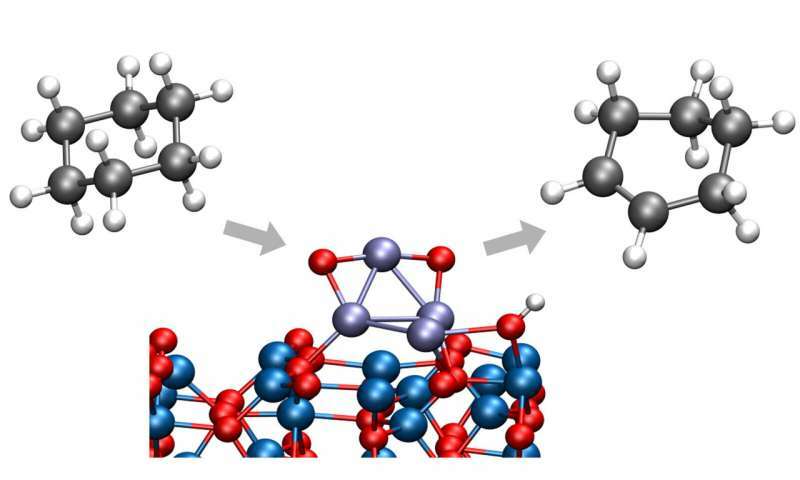 They discovered that the clusters carried out partial dehydrogenation of the cyclohexane at temperatures right around 100 degrees Celsius—far lower than had been previously observed for this kind of reaction, and the clusters retained their oxidized nature and stability at reaction temperatures up to 300°C. Vajda and Curtiss noted that the highly selective catalyst is long-lived and does not get poisoned or degraded by the reaction. In theoretical and experimental investigation of the size of the catalyst, the researchers found that clusters of size four and twenty-seven atoms were roughly equally efficient in carrying out the reaction. "It seems as though as long as the catalyst is below roughly one nanometer in size, this composition works well—an important factor for the potential scaleup of this class of catalysts by more traditional, though less size-selective, synthesis routes." Vajda said.